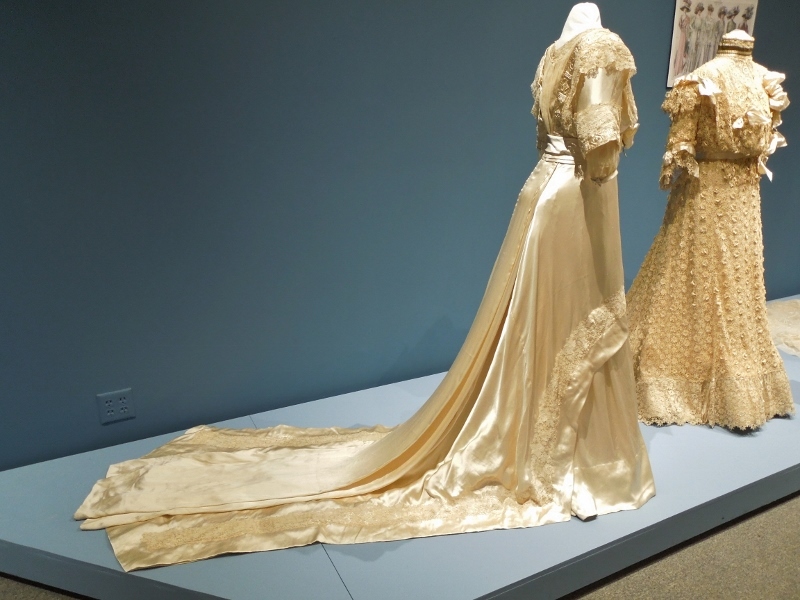 “Complex works of art,” curator Sheryl Peters said of wedding gowns dating from about 1906 to 1915. In this, our first dress, the lace around this collar is the most delicate I have ever seen. It looks as if it would dissolve if I breathe on it. Silk cord runs just above it, at the top of the collar, and also below the lace. It is looped. 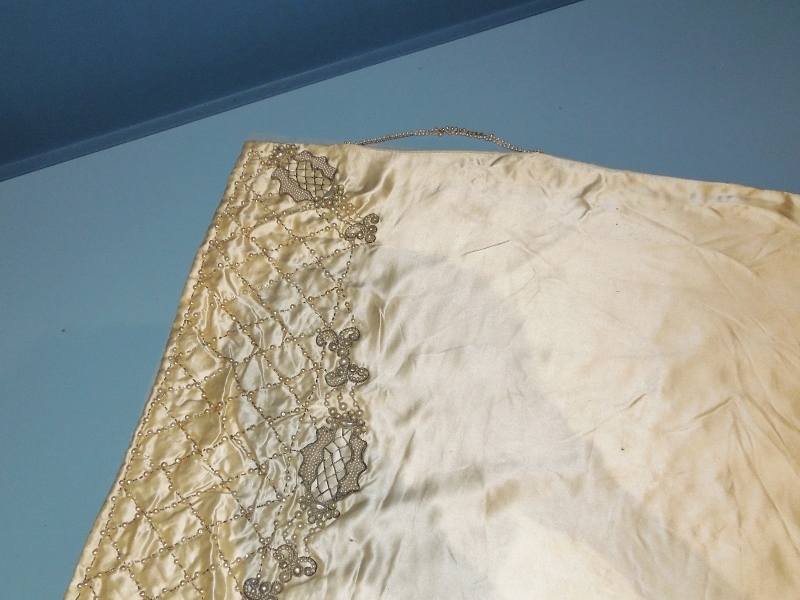 That same silk cord is pulled through net elsewhere on this dress to make elaborate designs on the bodice, cuffs and the belt. Long gloves would have been worn with all of these dresses, extending under the sleeve. 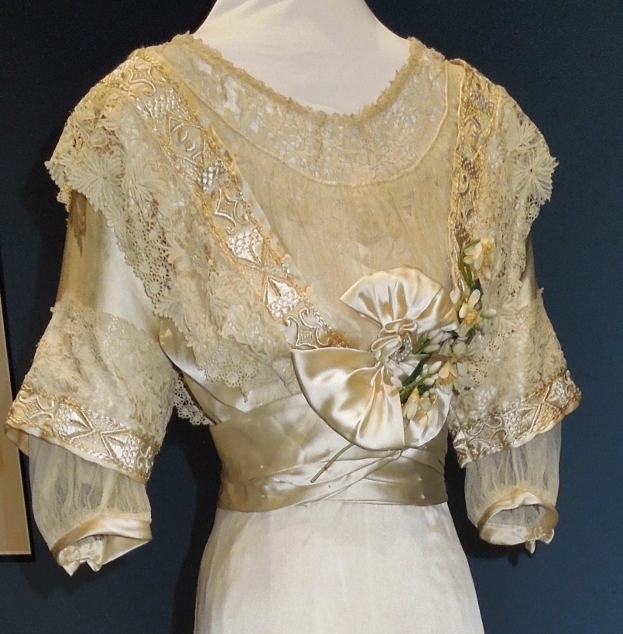 This bridal gown was worn in 1910, with the jacket over it. 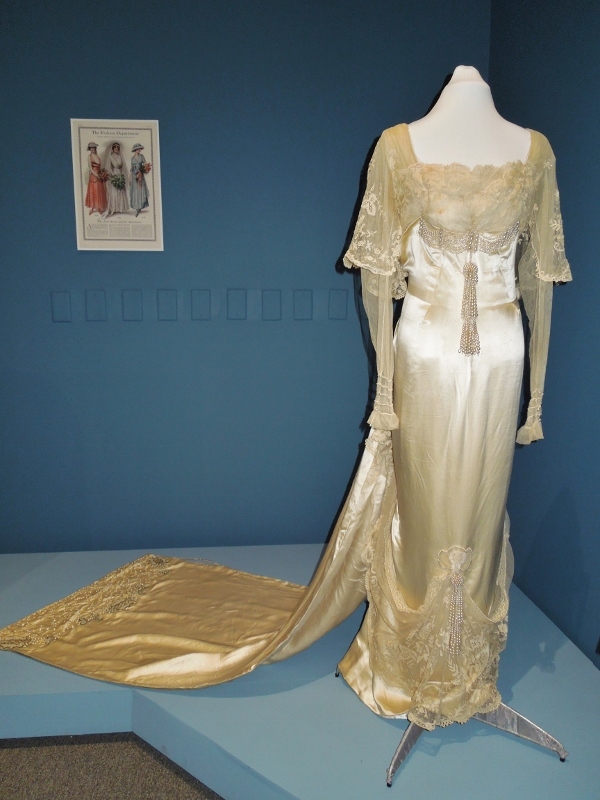 This silk gown was worn by bride Louvena Grace Dolson in 1911. The long, narrow pleated portions, like the one running down the center of this dress, were made on a separate piece of silk. That piece of silk was pleated and stitched, then cut into strips. The seamstress then sewed lace trim all around each strip of pleated silk before she inserted them into this opulent creation. This 1914 gown has faux orange blossoms. Orange trees bear fruit and bloom at the same time, and so are a symbol of fertility. This gown has a beautiful train that is pleated when viewed from the side. 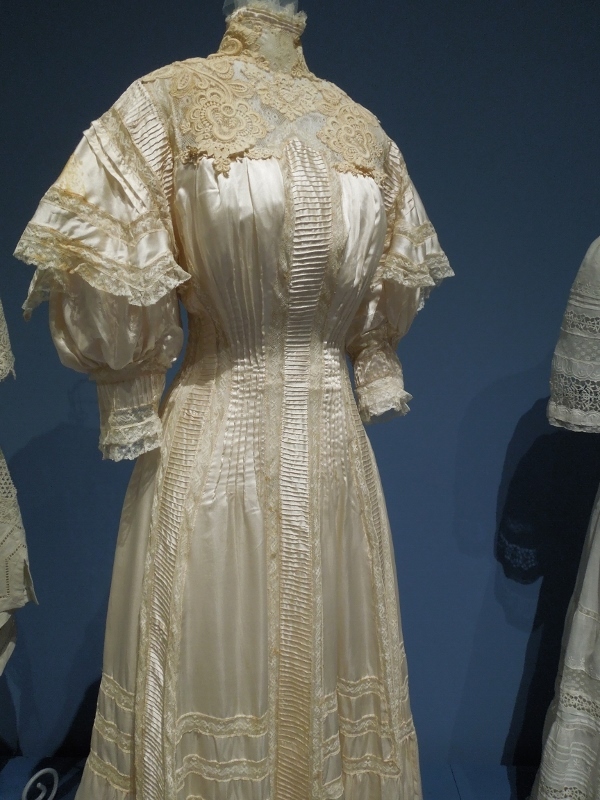 When I give tours of “I Do, I Do, Pasadena Ties the Knot, 1850-1950,” patrons ask which of the forty-two dresses is my favorite. My favorite, pictured below, was worn in 1915 by Margaret Whitney Collins and almost fifty years later by Julia Collins Haselton. I would have worn this dress if I’d had the chance. Swags and big tassels of faux pearls. The train has a handle on it — you can see it at the top of this photo — so the bride could hold up the train at the reception while she walked. And danced with her groom. 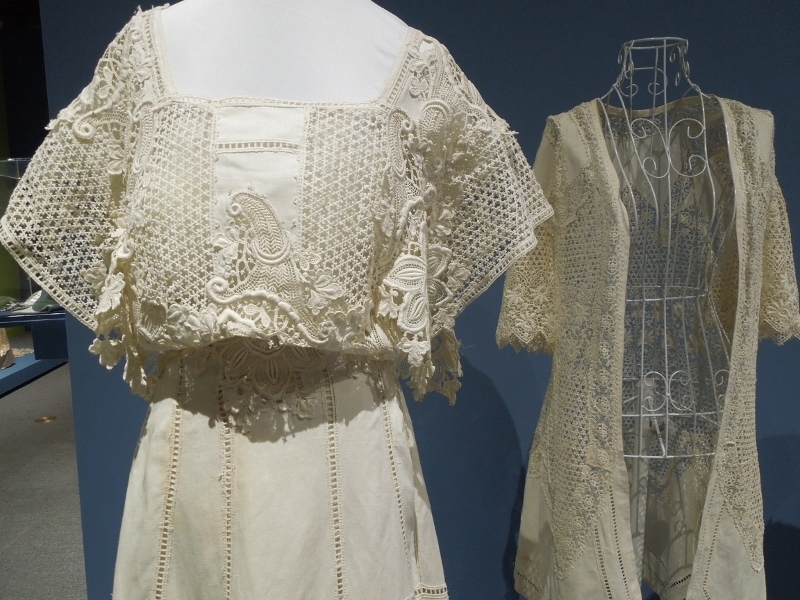 These and many other beautiful dresses are on display at the Pasadena Museum of History, only until July 14. My next post will feature beaded wedding gowns from the 1920s, and the following post will highlight dresses from the 1930s in historical context. I’ve seen this exhibit and loved it. I had no idea how fascinating it would be! Thanks for a very interesting blog read! The photos added much to the enjoyment of this fascinating subject. These gowns are exquisite. There is a lot to appreciate in this wonderful art of the wedding dress. I must go see them before July 14. The gowns really are exquisite. I am happy to share them and I’ll miss them when they’re gone. What breathtaking skill to sew these. I remember my mother’s silk gown which hung in our attic when I was in grade school. When the late 1940s rolled around and my parents’ budget was tight, she cut it to pieces to make my doll Marietta a dress for Christmas. It was a lovely gesture to make a frugal family’s little girl have a happy holiday but I wish today I had it preserved and saw her gown in a museum like these. What a touching story, Judith!